How Small Can They Get? 6mm-Mice Can Get Into Just About Anything! ‘Tis the season for mice and other rodents to venture inside New Jersey homes. You don’t want a mouse in your house, but sometimes it’s unavoidable. Did you know that there could be several mouse entry points all around your house? You’re probably not even aware of how small their little bodies can become. The good news is that when it comes to pest control Brielle NJ residents have somewhere they can turn for help. How Much Room do Mice Need to Get Through? It turns out that they really don’t need much room at all. An ordinary house mouse can squeeze through the tiniest of spaces. If you have a gap under a door that is 1/4 inch in height, they can get through it. They can also get through holes that are about 3/8 of an inch wide. What are House Mice Looking for? They’re looking for several things that are all inside your home. They’re seeking warmth and shelter from the cold fall and winter air. Of course, they’re also looking for food and water, and your home presents the perfect safe haven for them. 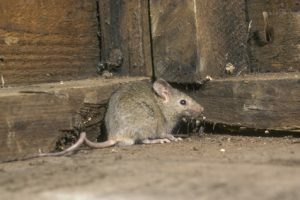 You might not be able to seal up all the openings for mice because many of them might be too small, but when it comes to pest control Brielle NJ residents can rely on Allison Pest Control for assistance. Contact us to get help!